The latest market report by PMR on the global high fiber feed market evaluates the trends, opportunities, and current market scenario, and provides insights and updates about the corresponding segments involved in the global high fiber feed market during the forecast period 2018-2027. The global high fiber feed market report further exhibits the estimated data for 2018, and forecast data up to 2027 in terms of value (US$ Mn) and volume (Tonnes). The present study exhibits the trends and market dynamics of the high fiber feed market in five major regions - North America, Latin America, Europe, Asia Pacific, and the Middle East & Africa. The report also includes the study of the current issues with consumers, and various future opportunities for the high fiber feed market. The report explores the global high fiber feed market for the period 2018–2027. The primary objective of the global high fiber feed market report is to provide insights into the opportunities in the market that are consistently supporting the transformation of global businesses that are associated with high fiber feed. It is very important to consider that, in an ever wavering economy, we provide the estimated (Y-o-Y) year-on-year growth rate in addition to the compound annual growth rate (CAGR) for the overall forecast, to better understand the analysis and evaluation of the global high fiber feed market, and to discover equitable opportunities. Yet another key feature of this report is that, the estimation of the global high fiber feed market and the corresponding revenue forecast are carried out in terms of absolute dollar opportunity. This is usually not prioritized while forecasting overall market numbers. Absolute dollar opportunity analysis is very essential in evaluating the degree of opportunity that a provider can observe to execute, as well as to contrast the potential resources from a sales perspective in the global high fiber feed market. The global high fiber feed market report starts with an elaborate executive summary, market definition, various segmentations that are included, and their respective shares in the market. The report further incorporates the major macro- and micro-economic factors that have an effect on the growth of the high fiber feed market. 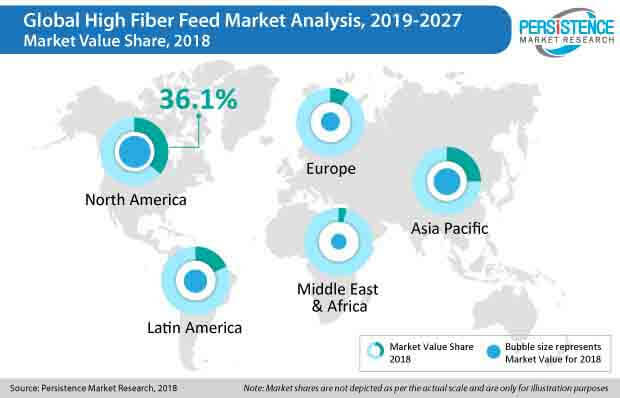 The report also highlights various market dynamics, which include the drivers and restraints in the global high fiber feed market. Current opportunities as well as on-going trends in the high fiber feed market are also discussed in this report. The report further underlines the study of the present issues with industrial processing, and opportunities for the high fiber feed market. It also encompasses a supply chain analysis, which provides a structural view of overall profitability from the manufacturer to the end user in the high fiber feed market. In order to provide users with a clear view of the global high fiber feed market, we have exhibited a competitive analysis of key market players and their strategic expansions. The competitive dashboard presents a detailed comparison of high fiber feed manufacturers on valuable parameters such as key product offerings, total revenue, key developments, and key strategies. The study intensifies the global high fiber feed market attractiveness analysis by livestock, source ingredient, type of fiber, and region. To evaluate the overall market size of high fiber feed, the report considers various fundamental aspects based on secondary research. Furthermore, it emphasizes on quantitative evaluation such as market shares by livestock, source ingredient, type of fiber, and region, and other qualitative data from primary respondents, which has been consolidated to arrive at clear and accurate market estimations. The market size was benchmarked taking into consideration global feed consumption. Global high fiber feed consumption was deduced by splitting global feed consumption data as per consumption patterns and requirements of livestock. The data was obtained from FAO, ITC, and various research publications. The data was cross referenced and triangulated by several research publications and company reports. The forecast presented in the high fiber feed market report arrives at the total revenue being generated, and expected revenue contribution in the future by the global high fiber feed market. Detailed profiles of companies that manufacture high fiber feed are included in report to analyze their developmental strategies, key product offerings, and recent developments, as they have a significant role in the global high fiber feed market. Some of the market players covered in the high fiber feed market report are Archer Daniels Midland Company, Triple Crown Nutrition Inc., The Pure Feed Company Limited, Gulshan Polyols Ltd, Dengie Crops Ltd, Muenster Milling Company, Manna Pro Products LLC., Roquette Frères, Ricegrowers Ltd, Alltech Inc., Colorado Mills, Mars Horsecare UK Limited, and others. PMR is committed to providing unbiased market research solutions to its clients. PMR follows a robust methodology for deducing the data that is included in this report. A demand-side approach is followed to estimate the sales of target products, followed by in-depth supply-side assessment of value generated, key trends, and events over a predefined period. Fiber can be defined as a type of carbohydrate that is not easily digested by the mammalian enzymes, but can potentially be digested by rumen microorganisms. Fibers include hemicellulose, cellulose, and lignin as well as other soluble fibers. The type, amount, and quality of fiber in feed can have an impact of the health and productivity of the animals. While protein and energy sources are considered as major ingredients in animal feed, fiber is gaining attention as one of the important components in feed. High fiber feed helps ease digestion as well as strengthen the gut microflora of animals, thus allowing the better absorption of nutrients, resulting in increased productivity and performance by the animals. By type of fiber, soluble as well as insoluble fibers will find wide consumption in feed mixes for multiple applications as well as for obtaining enhanced results. However, with recent researches and the growing demand for customized feed, the demand for soluble as well as insoluble fiber in the high fiber feed market is expected to increase rapidly. The expanding horse racing industry and increasing demand for equine food are major factors for the large market value share of the equines segment. The increasing demand from the ruminant feed industry, with the growing importance of high fiber in ruminant feed, attributes to the growth shown by the ruminants segment in the high fiber feed market. The flourishing pet feed industry and increasing attention of owners towards the well-being of their pets attribute to the growth in the demand for high fiber feed from the pet industry. The lower costs and easy availability of high fiber sources such as wheat bran and corn meal are credited to the growing demand for wheat and corn as an ingredient source for high fiber feed. Increasing awareness about the importance of soluble fiber in animal feed as well as the demand for compound feed explains the growth of other sources such as oatmeal, alfalfa meal, etc., in the global high fiber feed market. There has been a constant increase in the number of people that are more concerned about animal welfare, especially when it relates to food. There’s a growing belief that raising animals in healthier conditions has a number of valuable benefits, such as improved food safety, better nutrition, and enhanced flavor. High fiber feed improves gut health, thus, keeps the livestock healthy and fit. More livestock farmers are opting for animal nutrition products such as high fiber feed to maximize feed conversion and increase productivity. There has been a direct relation between per capita meat consumption and per capita GDP. Thus, with the increasing per-capita GDP of various developed and developing countries, there has been a rise in meat consumption across the globe. To satiate the demand for high-quality meat products in the market, animal husbandries are opting for nutritional solutions such as high fiber feed to maximize their output. With the growing penetration of the Internet, there has been a rise in awareness among livestock farmers about the use of high fiber feed and increased productivity of animals. Due to fluctuating income from agriculture as well as climatic changes, many farmers tend to turn to animal husbandry as an additional income. With the growing awareness from various sources, these farmers tend to opt for beneficial animal nutrition sources such as high fiber feed. This is proving to be a positive factor for the global high fiber feed market. The global high fiber feed market has been segmented on the basis of regions such as North America, Latin America, Asia Pacific, Europe, and the Middle East & Africa. The North American region currently dominates the global high fiber feed market, with the US and Canada being the leading horse feed producers. The North American region in the high fiber feed market is expected to show growth at a relatively lower CAGR, being a mature market. The high fiber feed market in MEA is expected to grow at a rapid pace, as it is the fastest growing region in the animal feed sector. The high fiber feed market in the APAC region is expected to grow at a significant rate, owing to the growing ruminant population and demand for animal feed. The high fiber feed market in Latin America is expected to grow at a significant CAGR, owing to the growing demand for high fiber feed, especially from Brazil.